This was a commission from the Wonderful Vicki Mortimer to make a set of mechanical wings for Wayne McGregor's new ballet. Each wing had over a hundred hand cut parts to allow the feathers to open and close realistically. 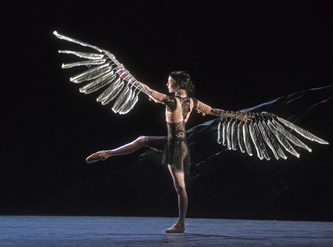 it's basically a fifteen bar linkage taking movement from the dancers elbow and transferring it down each feather. This leaves the dancer in control in a very intuitive manner. Big thanks to Sarah Lamb & Melissa Hamilton, the two principle dancers who where complete dudes during the building process.